Traveling opens up our eyes to many different things and one of those is diverse cuisines. Since most of us can’t travel for a living, we can sample a variety of recipes from countries around the world to learn more about their culture. It also helps us to understand what foods are available to them and what their staples are. My most recent recipe adventure was to try out a tagine. 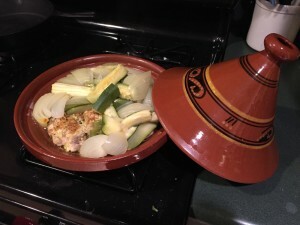 A tagine is a clay dish with a lid that resembles a cone that is commonly used in Morocco to prepare many of their meals. For those of us that do not use it daily, it must be soaked in water for 24-48 hours before use to prevent it from cracking. Many also use a heat diffuser so that the clay does not heat too quickly. The benefit to using a tagine is that it can be a one pot meal. For those who are trying to keep cleaning to a minimum or don’t want to have to keep stirring their meal, this is a great alternative. Most meals are accompanied with couscous, which is a course-ground wheat or semolina. Interestingly enough, this is the same type of wheat that is used to make pasta noodles. The first recipe I tried called for chicken thighs, zucchini, onions and spices (pictured here). It tasted okay, but it didn’t have the taste I was looking for. Most Moroccan food has turmeric or saffron and this recipe did not call for either. I decided I needed to try a different recipe to get a true taste of the cuisine. I found one that called for turmeric, ginger, olives and preserved lemons. The spices changed the color of the chicken to be a rich orange and included a gingery yet spicy flavor. It melted in your mouth and included a great juice to be poured over the couscous. While we gobbled up the platter before I managed to take a picture, this one was much more authentic tasting and one I will repeat. Now that I’ve added Moroccan to my recipe repertoire, it’s on to the next country’s cuisine. Are there any suggestions of what I should try?